QUETTA: Renowned educationist Professor Fazal Bari was gunned down here on Monday and the Baloch Liberation Army claimed responsibility for the attack. Professor Bari, Principal of the Tamir-i-Nau Public Model school and a former chairman of the Balochistan Board of Intermediate and Secondary Education, was going to the school when the gunmen on a motorcycle opened fire at his car near Bhosa Mandi, killing him on the spot and injuring his driver Abdul Sattar. The Tamir-i-Nu-Public college and its affiliated schools announced a three-day closure to mourn the death of the widely respected educationist. The killing triggered protests by students who first reached the civil hospital after hearing the news of the murder and later marched on various roads, chanting slogans against the government for its failure to stop the target killings in the province. They later went to the Governor’s House and Chief Minister’s House where they held a demonstration and demanded immediate arrest of the killers. 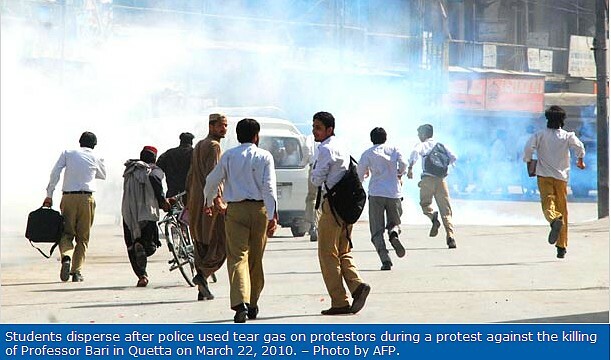 Police fired tear-gas shells and baton charged the protesting students and detained three of them. The Namaz-i-Janaza of Prof Bari was offered in the Tamir-i-Nu-Public College ground and his body was flown to Lahore. Professor Bari’s son Abid said that his family had no enmity with anyone. Police raided various areas in the city and took into custody 25 suspects. “We have picked up over two dozen suspects who are under interrogation,” police sources said, adding that it was an incident of target killing. Meerik Baloch, a spokesman for Baloch Liberation Army, calling from an unspecified place, told newsmen that the BLA had organised the murder. This entry was posted in pakistan + blasts. Bookmark the permalink.